The holidays are upon us, which means New Years Resolutions are just around the corner. Over the past few months I've been trying to force myself to come to terms with a large deposit of fat that has taken up residence on my body. 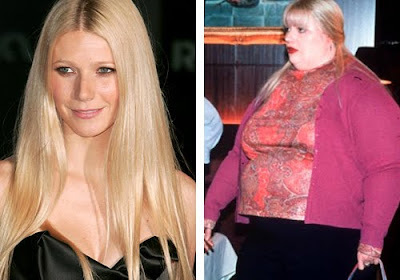 I would say for at least the last three years, each time I look in the mirror I feel like I'm not really looking at me, I think the person in the mirror is actually wearing a fat suit, like Gwyneth Paltrow in Shallow Hal. I've tried to tackle this problem in fits and starts, losing ten to twenty pounds and then putting it right back on only to continue on my relentless march towards obesity and probably diabetes. It is so disheartening. I theoretically know what I should be doing, but I just cannot seem to make myself do it! It is not like I have no discipline, I just finished a Ph.D. for goodness sake! Yet still, with each passing week new pounds are added and the number of pounds I need to loose continues to balloon, such that I no longer feel like I will ever be thin again. It is not that I don't want to be thin, I really do! I love clothes and I hate that the most fashion forward options for me reside in the plus size section at my local Target. However I just don't know what to do to make it all seem managable. At this point, even loosing ten pounds wouldn't feel like an accomplishment because I would still feel totally disgusted by the number on the scale. We all have this problem. I cannot, for the life of me, keep myself from eating crap if it's in the house. So if I feel the pudge coming on, I just don't go near the ice cream in the grocery store. And I looove to bake, just to experiment. So I bake things, eat a couple bites, and give the rest to my dad's friends. Haha. Hopefully you will be inspired by the beginning of a new year...I wish you the best of luck!! Eleven years ago, when my father died, I decided to get a handle on my weight problem. A friend was going to Weight Watchers and I went with her. It really is an amazing way to lose weight, as nothing is off limits. If you goof up and wolf down a pan of brownies, oh well, start right back in the next day. Every food has a point value, and you are allowed a certain number of points each day, according to your weight. There are certain tricks I learned along the way; eat veggies, veggies, veggies, and POPCORN. I hope you give WW a try. New Years is such a great time for new ideas and fresh starts. Good luck and have a happy new year. I am right there with you sister. Congrats on the PhD. I do not know the person when I look in the mirror. I need some inspiration and a treadmill.